Lest we forget. After the death of a recruit at Fort Dix, in February 1976, the US government feared a swine flu pandemic and the resulting public outcry. A universal vaccination program was started, despite no further deaths and only a handful of further cases at Fort Dix. To get the public behind the vaccinations the Ford Administration launched an advertising campaign, with some scare-tactics that even today's media organizations would be proud of. 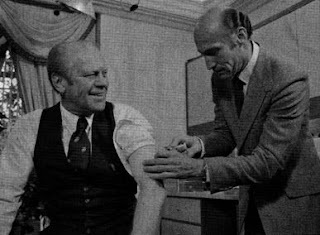 Then, in October 1976, three elderly patients died after getting their swine flu vaccinations (although this was later shown to be an unrelated event). The media circus that followed turned public opinion against the program. Soon after a paralyzing neuromuscular disorder (Guillain-Barré syndrome) was linked to the shots, further eroding support for the jabs. The program was stopped in December 1976. 1976. One death from swine flu. Over 40 million jabs causing about 500 neuromuscular cases and 25 resulting deaths from complications. The backlash against this poorly thought out vaccination campaign unfortunately mutated into a general anti-vaccination movement that has severely limited the effectiveness of many important immunization programs since. This time around it's the media and public paranoia that are leading to the widespread taking of unnecessary medicines. Oseltamivir, better known as Tamiflu, has been linked to a number of adverse effects, including potential fatal neurological side-effects, particularly in children under twenty. However, as these effects are behavioural changes, such as causing self-harm, they are difficult to quantify. Still, in 2006 the FDA changed the warning on Tamiflu to include the possible side-effects of "delirium, hallucinations or other related behavior". Only time will tell what the effect of widespread use of Tamiflu by worried, but otherwise healthy, individuals will do. Only time will tell whether fear of swine flu is once again more deadly than the disease itself.